Matt Mikalatos: Flying cars! Now I just need a jetpack. 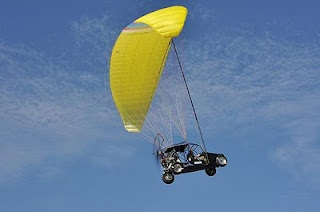 The big news in missionary circles right now is that Steve Saint just got his flying car approved by the FAA. Here's the article from CNN. Here's the website for "The Maverick." Here's a video of the car in action. Steve Saint, as you may already know, is the son of martyred missionary Nate Saint, and has dedicated his life to helping the Waodani tribe (the same tribe that killed his father) interact with the modern world without being consumed by it. This would be an excellent Christmas gift for me, and it only costs 80 thousand dollars. Sweet! I-TEC showed this car in the Tyndale parking lot. Sadly, no live demonstration. Sadder still, no test drives. There is a movie about Steve and his dad called "End of the Spear". This should have been the "Imaginary Jesus" contest prize! I highly recommend the film "End of the Spear" about this family.